Captain America wasn't the only patriotic hero created by the legendary team of Joe Simon and Jack Kirby. In addition to the Guardian (blue outfit, carried a shield), the Silver Age Shield for Archie (who didn't carry a shield), the duo also developed the Fighting American, one of the first heroes to delve into satire. Will Eisner's The Spirit had many satirical elements, as did Jack Cole's work on Plastic Man which is much heralded today, but in the Fighting American Simon and Kirby turned a wry eye toward what the politics of the day when the series was launched in 1954. 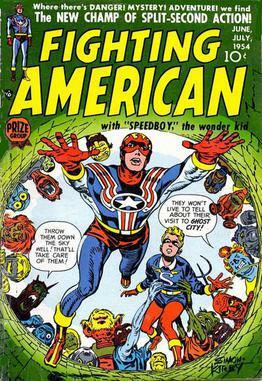 Originally conceived as another riff on their established patriotic hero motif, the creators soured on the McCarthy-era definition of patriotism and ended up developing a character who parodied the climate and superheroes in general, but who still personified a more traditional patriotism including a love of free speech. "The first stories were deadly serious. Fighting American was the first [C]ommie-basher in comics. We were all caught up in Senator McCarthy's vendetta against the 'red menace.' But soon it became evident that McCarthy ... had gone too far, damaging innocent Americans.... Then, the turnaround, [as] his side became talked of as the lunatic fringe.... Jack and I quickly became uncomfortable with Fighting American's cold war. Instead, we relaxed and had fun with the characters." Radio announcer Johnny Flagg is murdered by foreign agents, but his younger, feeble brother, Nelson, allows his mind to be transferred to Johnny's rebuilt and enhanced body as the Fighting American. Joined by the requisite sidekick, Speedboy, he confronted menaces such as Hotsky Trotsky, Poison Ivan, and Round Robin. �It's impossible to know for sure, but the reason it failed to find public acceptance may also be why it is so highly regarded today - it didn't take itself or, apparently, the Cold War, seriously,� wrote Don Makstein on his Toonopedia website. Fighting American ran seven issues from Prize, its original publisher. An eighth issue was completed, but didn't appear until Harvey Comics released a one-shot in 1966 combined with the original #1. The character returned when Marvel Comics collected all eight issues in a 1989 hardcover. A new incarnation debuted in a 1994 six-issue series from DC Comics, and Rob Liefeld brought the character back again under his Awesome Entertainment logo in 1997. Another new version was announced more recently, but it did not happen. Titan Books has issued a new collection of the original Simon & Kirby material.